Anyone who has been singing and playing on the ‘circuit’ for any length of time will tell you – ‘it sure ain’t what it used to be’. When I first began 25 years ago, it wasn’t unusual for us to have between 7 &10 shows a week – 2 on Fridays and even 3 on a Saturday, not to mention Tue – Thu with weddings and private parties thrown in for good measure. With many great bars struggling to keep their doors open – smoking bans and supermarkets selling cheap alcohol, the last thing many bars can afford is for live entertainment. In many ways it still boils down to ‘bums on seats’ and people supporting their local bar as well as live music. I didn’t start singing until 1995 or thereabouts. I was always terrified of a microphone for some reason – when I say ‘terrified’…I mean ‘really terrified’. I had huge confidence issues regarding taking the final step to becoming a singer. Strange when you consider that I had now been gigging for over 7 years as a keyboard player and never had any reason to feel like this – but then I’d never actually sung in public. For me, to sing would be the icing on the cake, but somewhere inside I had the idea that if I was told to ‘not give up my day job’ it would probably ruin me completely. In a ‘keyboards for sale’ sort of way. This was in no way meant in a disrespectful manner to the good public out there, but I suddenly understood that people wouldn’t hang on my ‘every line’. There also wouldn’t be a trap door under me that would open if I happened to stray off key or make a mistake. What really was the worst that could happen? There is a great saying that when the torment of ‘not’ doing something becomes greater that the fear of actually ‘doing’ it, you’re probably going to take the leap of faith. It can be applied to just about anything in life which frightens us, and for me that leap came while playing in front of 500 people. The song was Mustang Sally and once again I was terrified. 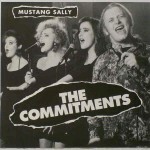 Mustang Sally by the Commitments. My ‘breakthrough’ moment into singing. I remember thinking ‘why are people starting to dance to ‘me’ singing? No rotten cabbages or tomatoes came my way, nobody dragged me off stage – they even clapped when I’d finished. The rest of the night is pretty much a blur to me – I don’t think I slept for 3 days. I was now a singer – like a sponge wanting to learn more and more songs for my repertoire! A rare outing at the John Hewitt, Belfast. 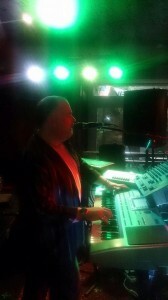 One of the live shows. 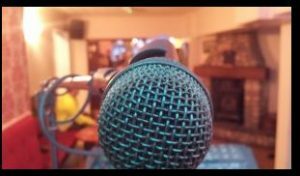 Today I’m a solo singer / keyboard player, having worked with 2-piece, 3-piece, 4-piece; right up to fronting a 7-piece blues band when I lived in England – not to mention the 7-piece we got together to record Household Honey for the BBC. 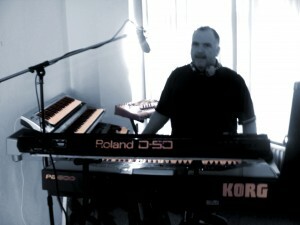 I’m asked often if I do any of my own original songs in my set, and it’s a very tricky area for me to answer. I do a few – but not all. 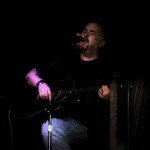 Unless I’m doing a rare acoustic appearance in an ‘open mic’ night, I like to keep the cover stuff and the original material separate. I’ve done a few festivals and support slots to some great live bands with just a guitar and my own material – and it’s a truly liberating experience; but the songs I’m writing now are such that it just wouldn’t be feasible without turning into a bigger show in it’s own right. The logistics of bringing all the equipment I use for a 30/45-minute slot, to me, just wouldn’t make sense. This is maybe something which may be in the pipeline for later however, – a full electro/acoustic crossover original show with all the bells and whistles. It could be fun – and hopefully, just a little different from other shows out there at the moment. 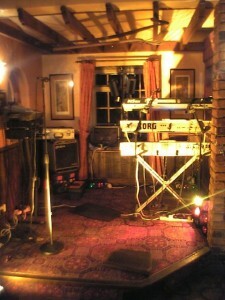 Bringing even all the keyboards I use today to an open mic night would be an issue in itself; not to mention the computers etc..